In this Oasis tapestry we see an idealised scene of a oasis in the desert, inspired by the work of the famous Dutch painter Albert Eckhout from the 17th century. This tapestry design is from an 8 part series of tapestries called the Tentures des Indes, woven at the Gobelins during their prolific tapestry production period in the 17th century. These Gobelins wall tapestries were woven in France based on paintings which were given to Louis XIV in 1679. In 'Oasis', one of the most exotic pieces, we see a lush oasis of running water, exotic plants, palm tree, fruits, flowers, coconuts and birds and ducks enjoying the fertile sanctuary in the desert. This is an exotic work to have in any room in your home. 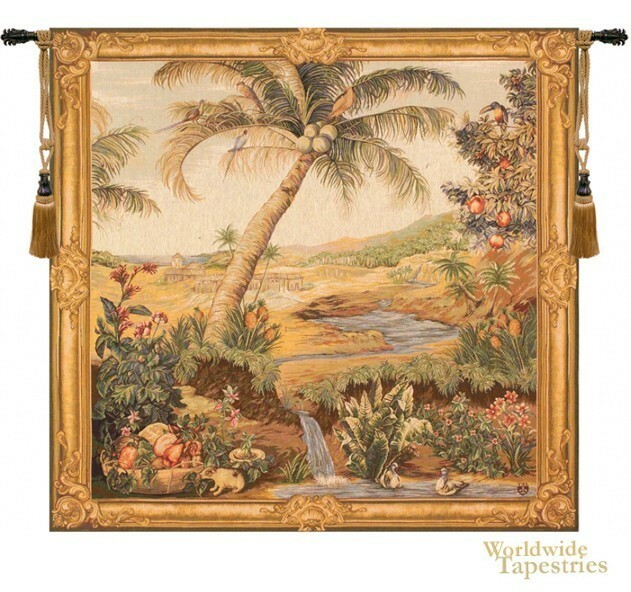 This French art tapestry 'Oasis' is lined and has a tunnel for easy hanging. Note: tapestry rod and tassels, where pictured, are not included in the price.